PRODUCTIVITY INC NAMED AS DIAMOND LEVEL DISTRIBUTOR FOR DESKTOP METAL: Now Offering Affordable, Safe And Precise Metal 3d Printing For Both Prototyping And Mass Production – Adds Metal 3D Printing Systems to their Manufacturing Solutions Portfolio. Plymouth, MN, June 2017 — Productivity Inc, the leading machine tool distributor serving the upper Midwest since 1968, is pleased to announce its Diamond status partnership with Desktop Metal, a metal 3D printing system company based in Burlington, Massachusetts. The systems allow customers to produce metal parts – from prototyping through mass production. Desktop Metal has changed the rules of traditional metal manufacturing solutions with the advent of first-of-its-kind innovative approaches that reduce costs and significantly increase speed, safety, and print quality. From Desktop Metal: “With their strong engineering and sales teams, and long-term success with manufacturers, Productivity was easily a top choice to represent Desktop Metal,” said CEO Ric Fulop. In April, Desktop Metal launched the Studio System™ and Production System™, covering the full product lifecycle – from prototyping to mass production – which mark a fundamental shift in how products will be developed and brought to market. 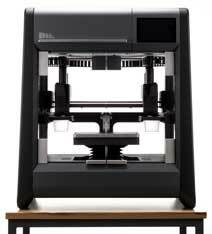 The Studio System is the first office-friendly metal 3D printing system for rapid prototyping. The Production System is the fastest 3D printing system for mass production of high-resolution metal parts today. From Productivity: “The addition of both the Studio System™ and Production System™ from Desktop Metal continues to round out our metalworking products offering, and allows Productivity to further its commitment to being a single source supplier and helping our customers solve their manufacturing challenges and opportunities,” said Pete Nelson, Machine Tool and 3D Printing Manager. Desktop Metal, recently launched two systems that mark a fundamental shift in how products will be developed and brought to market. The Studio System is available to reserve now with shipping beginning later this year. The complete system, including printer, debinder and furnace, is $120,000. Desktop Metal, Inc., based in Burlington, Massachusetts, is accelerating the transformation of manufacturing with end-to-end metal 3D printing solutions. Founded in 2015 by leaders in advanced manufacturing, metallurgy, and robotics, the company is addressing the unmet challenges of speed, cost, and quality to make metal 3D printing an essential tool for engineers and manufacturers around the world. For more information, visit www.desktopmetal.com. Productivity Inc, based in Plymouth, Minnesota, has been distributing a broad range of CNC machine tools, tooling and accessories and related metalworking products. Productivity Inc. can assist in the research, evaluation and planning of your machine tool purchase. As a single source machine tool supplier, Productivity Inc. offers Machine Tools, Tooling and Accessories, Machine Service, Preventive Maintenance, Turnkey Systems, Robotics and Automation. Our MachinesUsed.com division will sell your surplus equipment via its online auctions. Productivity Inc provides innovative solutions for manufacturing in Minnesota, North Dakota, South Dakota, Iowa, Nebraska and Western Wisconsin. For more information on Productivity Inc., please go to productivity.com or call 1.800.328.3272.